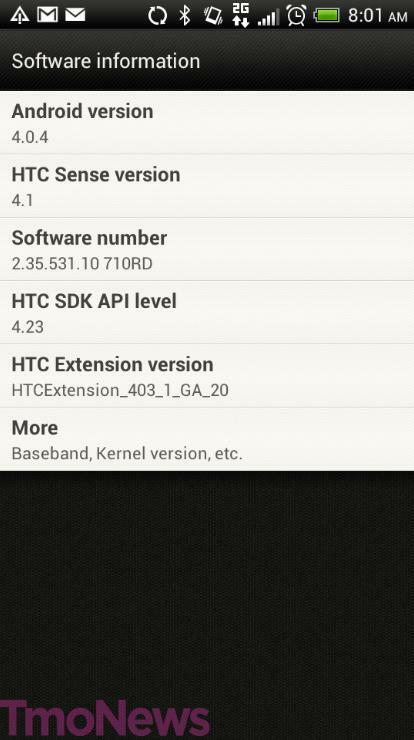 Good morning HTC One S owners, there’s a minor software update rolling out this morning and we hope it’s in preparation for a future Jelly Bean Android 4.1 update. This mornings update will take your smartphone from software version 2.35.531.7 710RD to 2.35.531. 10710RD. T-Mobile’s current HTC One S support page doesn’t reflect this mornings update which means we’re not quite sure what has changed. We do know the update is around 30MB in size and well, that’s actually all we know. We’re hopeful T-Mobile will update its support page early with any necessary or important changes, but at this point the update feels incredibly minor and only newsworthy in the sense that it isn’t the update we want it to be. Keep your eye on the T-Mobile support link below for any changes throughout the day. Not one of the few. It’s still a competitor for Galaxy S 3.
still using???? Its a great device, i love mine! Have you really been in rehab that long? Still use? Is there something wrong with the One S? I’ve had one since it was released and love it. Extremely quick, no lag. Very little issues at all. I got it new in April. Some of us only upgrade when the contract rolls around. The One by HTC is a top-rated Android phone series. They plan on releasing Jelly Bean for this model. For one… does anyone else hate the fact that if you misstype a word, you can’t just click on it and change it like the Samsung Galaxy does? That’s news to me. What keyboard are you using? anyone did the update yet?? Noticed anything new?! The home button always launches the Sense UI for me now. Which is a bummer. I couldn’t find that option, I rebooted my phone and then it asked when I pressed the home button. I use GoLauncher EX btw. install home switcher. It will let you select the launcher you want when you have multiple launchers installed. Updated…. no idea what it did. Hopefully it addresses the Wi-Fi calling bugs. Will try in a bit. Same S#!t. Losing incoming calls while on Wi-Fi calling. Switching back to cellular preferred. The only thing I can think of is that I recently relocked my bootloader, and reinstalled stock via RUU after having CM10 installed on the phone, and that caused it. It’s an update to fix the issue where the phone would get stuck on 2g that was caused by the last update. Bad idea, don’t ever switch to WCDMA only. I do it all the time to force it onto the network, but should you walk inside a building, you lose signal where T-Mobile WCDMA doesn’t penetrate. GSM won’t be there giving you coverage. Therefore, you might miss important calls. Best thing you should do is to set it to WCDMA Preferred. same here i hoped it would have solved my stuck on 2g issue but nothing! And i live in So.Cal with in an hour of L.A. (i have 4g in my area) and my wife has 4g on her tmo phone..well hopefully this is progress for the real deal!! Don’t count on it. 4.1 yes, if you have a One S, but it’ll probably end there. I think I sent 4.1 Lol that’s jellybean right? They’re both Jelly Bean. 4.2 adds a few little things like settings in the notifications center (i still like Power Toggles’ more) and Photosphere. I doubt the One S will get it, but 4.1 is more importamt anyway. Better performance than ICS and Google Now. LOL.. don’t update guys… this might be an update to add advertisements on your phone.. just like they did with Visual voicemail and all their T-Mobile apps… HAHAHA (mad). Shame that I’m in the process of selling mine, and I don’t feel like booting it up for any updates. They took too long for Jelly Bean. 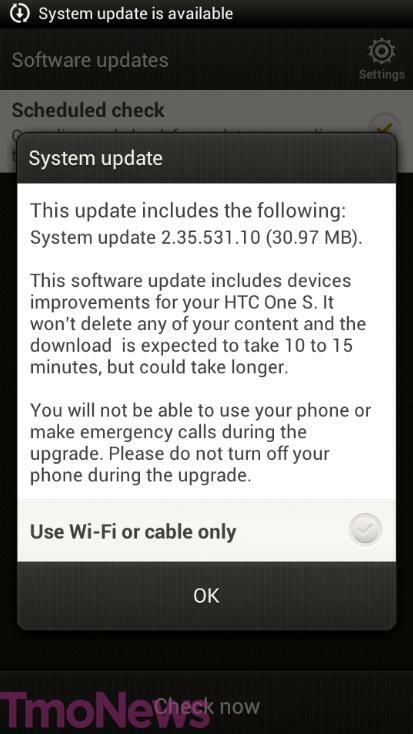 I wonder why it took so long… it turns out to be the same update that was mentioned at https://www.tmonews.com/2012/09/htc-one-s-android-4-0-4-software-update-pushing-out/ . I just got it pushed today (and swear I have looked for updates more than once since September). I, too, believe this is a fix to streamline the processes for other updates to come. No word from HTC yet despite checking with their customer service, however, apparently most carriers keep these updates as a hush-hush ordeal. Referring to Jelly Bean, that is. This is the official released document for the firmware update — http://support.t-mobile.com/docs/DOC-4262 . Explains the updates and fixes a little further. Has anyone had any issues with reboot or freezing issues since this update? Can someone please help me. Every time, I go to check for updates, over WiFi and 4g, I still can’t even recieve the 4.0.4 update or this one. I recently bought this phone new and I am really confuses and worried that I won’t be able to revive jelly bean. Any help appreciated.